Foot games that require larger decks. A range of Card Trays is also available. Hand and Foot is a North American game related to Canasta, in which each player is dealt two sets of cards - the hand, which is played first, and the foot, which is played when the hand has been used up. There are numerous variations of this game and no standard rules. The most usual version is for four players in partnership, and this will be described first; these rules were contributed by Bill Whitnack. A number of variations are then given - I would like to thank Barbara Bain, Dave Petrie, Brian Brouillette and Steve Simpson for providing information about these. Although most people say that Hand and Foot is best played by four people in partnerships, it can also be played by six in two teams of three, or by any number of people playing as individuals. Adda52 Rummy offers live, multiplayer 13 and 21 Card Indian Rummy on the web and Android phones and tablets. It is owned by Gaussian Networks and was registered in 2012. Partners sit opposite each other. Five decks of cards are used, including two jokers per deck (270 cards in all). Choose which partnership will deal first. After the cards have been thoroughly mixed, one partner takes part of the deck, deals four face-down stacks of 13 cards and passes them around the table in a clockwise direction until each player has a stack - the hand. Meanwhile the partner of the hand dealer takes another part of the deck and deals another four stacks of 13 cards each and passes them also in a clockwise direction until each player has a second stack - the foot. The remainder of the undealt cards are put in a face-down pile in the middle of the table to form a stock. The top card of the stock is turned face-up and placed next to it to start a discard pile. If this card is a red three or wild card (two or joker) it is buried in the stock and a new card turned up. The players' "foot" stacks are placed face down around the stock and discard piles - the players are not allowed to look at them until they have played all the cards in their hands. Each player picks up their "hand" stack, and play begins with the player to the left of the one who dealt the hands. After the end of the play, the turn to deal passes to the left. A complete game consists of four deals. a wild meld consists entirely of wild cards. A meld of seven cards is complete and is called a pile. While melds are fanned out face up, complete piles are squared up and the cards placed on top shows the type - a red card for a clean pile, a black card for a dirty pile, and a joker for a wild pile (or a two if it contains no joker). Usually the complete piles of seven cards are kept in front of one member of a partnership (along with red threes), while the other partner keeps the incomplete melds of three to six cards. you must ask partner's permission to go out. If partner agrees you must meld all of your remaining cards, or meld all but one of your remaining cards and discard your last card. If partner says no, you are not allowed to go out on that turn. See also the section End of the Play. There are also the following Bonus Points. Both teams score points for any complete piles they have made, in addition to the scores for the cards within the pile. Only the team that goes out scores the bonus for going out, obviously. The red threes count plus 100 points if they have been placed face up on the table with your melds, but minus 100 points if not (for example if you do not manage to pick up your foot before an opponent goes out, any red threes in it will score minus 100 points). In each deal, there is a minimum requirement for the total value of the cards making up the first meld put down by each partnership. Red threes do not count towards this minimum; nor does the bonus for a seven card pile, so for example seven sixes count only 35 points and are not sufficient for an initial meld. discarding one card on top of the discard pile. If you draw a red three from the stock you should immediately place it face up on the table with your melds and draw a new card from the stock to replace it. you must immediately meld these three cards (the two you are holding and the top discard), possibly along with other cards that you are holding. After picking up from the discard pile and melding, you complete your turn by discarding one card as usual. If your side has not yet melded (putting down red threes does not count as melding), then the first time that you meld you must put down cards whose individual values add up to at least the minimum meld requirement. You can put down several melds at once to achieve this if you wish. If you are picking up the pile, you can meld additional cards from your hand along with the the top discard and the two that match it to help make up your minimum count, and some of these additional cards could be wild. However, you cannot count any of the other 6 cards you are about to pick up from the discard pile towards this minimum. Example: It is the first round (minimum 50 points). A nine is discarded by the player to your right and in your hand you hold two nines and a two. You can use your two nines to take the top 7 cards of the discard pile and make a dirty meld of three nines and a two for 50 points. You would not be allowed to do this if the two was buried in the discard pile rather than held in your hand. A meld cannot contain more than seven cards, and a partnership is not allowed to have two incomplete melds of the same rank, but if you complete a pile, you can then start another meld of the same rank. Therefore if you have an incomplete meld of five or six cards on the table, you will not be able to pick up a card of that rank from the discard pile unless you have enough cards of that rank to finish the first seven card pile and make a new three card meld of the same rank. These cards must all come from your holding and the top card of the pile - again you are not allowed to make use of other cards you are about to pick up from the discard pile to satisfy the requirement. Example: The top card of the discard pile is an eight, and there is another eight buried three cards deep. You have two eights and a two in your hand and a meld of five eights on the table. You are not allowed to pick up from the discard pile, because having completed your pile of eights, you will only have two cards with which to start your new meld of eights (the buried eight cannot be included until you have made a legal meld). If you had three eights and a two in your hand, you could use the top eight from the discard pile and one of your eights to complete your eight pile, and start a new meld with two eights and a two. You could then pick up the next 6 cards of the discard pile and add the buried eight to your new meld as well. If you discard a black three, this blocks the next player from picking up from the discard pile. You may discard a wild card (though in practice it is unusual to do so). In this case the next player could only pick up the pile with two matching wild cards (two twos to pick up a two, or two jokers to pick up a joker). When you get rid of all the cards in your "hand", you then pick up your "foot" and continue to play from that. There are two slightly different ways this can happen. If you manage to meld all the cards from your "hand", you can immediately pick up your "foot" and continue your turn, discarding one card from it at the end. Alternatively, if you meld all the cards from your "hand" but one, and then discard this last card, you can pick up your "foot" and begin playing with it at the start of your next turn. Red threes count for the players if they are laid down on the table with their melds and against if not. Whenever you find that you are holding a red three you should immediately place it face up on the table with your melds and draw a replacement card from the stock. This can happen because you find it in your hand, or pick it up in your foot, or draw it from the stock, or (very exceptionally) pick it up from the discard pile (this could only happen if the original turned up card happened to be a red three). If your opponents "go out" before you have picked up your "foot" cards, any red threes in your "foot" will count against you, along with all the other cards it contains. Black threes have no use except to block the next player from picking up from the discard pile when you discard them. Any black threes that you are left with at the end count 5 points against you. There is no way to get rid of them other than by discarding them one at a time onto the discard pile. when the stockpile is depleted and a player wishes to draw from it. As already explained, you cannot go out until your team has completed the required piles (two dirty, two clean and one wild), and your partner has picked up their foot and played at least part of one turn from it. If you have not satisfied these conditions, or if you have satisfied them but your partner refuses permission for you to go out, then you are not allowed to leave yourself without any cards. That means that if you are playing from your foot, you must keep at least two cards in your hand after melding - one to discard and at least one to hold in your hand so that the game can continue. If the stock is depleted, the play will end as soon as someone wishes to draw from the stock and there are insufficient cards there. Both sides score for the melds they have put down, less the points for the cards remaining in their hands and feet, and no one gets the bonus for going out. It may be possible to continue playing for a few turns without a stock, as long as each player is able and willing to take and meld the previous player's discard, but as soon as someone wants to draw and is unable to, the hand is over. Try for higher "card count" melds (such as aces) if possible and if the cards are running for you. Try to keep a few pairs in hand of the ranks that you think the opposition may discard, so that you can perhaps pick up from the discard pile. This is especially useful while you are waiting for your partner to get into his / her foot. Often, however, you cannot take the discard pile because you are blocked by a black three discarded by your right hand opponent. Try not "burn" any more wild cards than you must (by making dirty melds), unless you have the wild meld well in hand, or unless you need to dirty a meld to get into your foot. It's a good idea always to save one wild card for just that purpose, and hope to pick up a few more wild cards in your foot. Wild cards are often the key to completing melds and "going out", although there are times when you may find you have too many of them. By agreement, if the card turned up to start the discard pile happens to be a wild card or a red three, it may be put back into the stock pile and another card turned up. Any number of people from two to six can play, using one more deck of cards than the number of players. Four or six can play as partners; with two three or five, everyone must play for themselves. The game for four players in partnerships is said to be best. This variation was contributed by Dave Petrie. Each player is dealt 11 cards as a hand and 13 as a foot. Completed melds of seven cards are called canastas. In melds (other than wild melds) you must have more normal cards than wild cards - so there can be up to 3 wild cards in a dirty canasta, and up to two wild cards in a dirty meld of five or six cards. Melds are not limited to seven cards; you can add further cards of the same rank to a canasta. Initial meld requirements are as described above, except that in the fourth round you need a hidden canasta (i.e. a complete meld of seven cards collected in your hand without using the discard pile). When picking up the discard pile, you take the whole thing, not just the top seven cards. 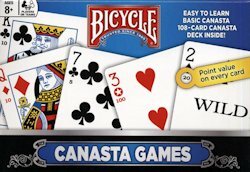 To "go out" you need at least one clean canasta, one dirty canasta and one wild card canasta. This version has much in common with Pennies from Heaven and has therefore been moved to that page. This is a version of Hand and Foot without partners, and was the first form of the game to be included on this page. The rules given below are more or less a copy of Steve Simpson's Hand and Foot page, which was last seen at http://people.ne.mediaone.net/ssimpson/handfoot.html - here is an archive copy. Steve Simpson reports that he learned this version from Rob Groz. Two or more players, playing as individuals. Normal playing cards including the jokers. One more deck than the number of people playing - i.e. three decks of cards for two people, five decks for four people, etc. All the cards are shuffled together and placed in the middle of the table in TWO piles. A gap is placed between the two piles for the discard pile. Each player deals his own cards to himself. Each player picks up a small pile of roughly 22 cards from either of the two piles. Each player then deals his cards in front of him into two piles of eleven cards each. If the player picked up exactly 22 cards on the first try then he gets 100 bonus points added to his score. If he has less than 22 cards he picks up more, as needed, from either of the two main decks. If he has more than 22 cards then the extra cards are returned to the main piles. Each player now has two piles of cards in front of himself. The left hand pile is the player's hand and the player picks up this pile. The right hand pile of cards is passed to the player on his right. This pile becomes the other player's foot. The foot piles stay face down until later in the game. The object of the game is to get the most points. There are four rounds to the game and on each round each player tries to get rid of all his cards while putting the most points he can on the table. Jokers and Twos are wild cards. In the game you make "sets" of cards which are three or more of the same card - three kings, five eights, etc. The suit of cards makes no difference. You cannot make a set of Jokers or Twos - these can only be used as wild cards. You cannot make a set of threes, regardless of the colour. Cards "down" on the table count for you and are added to your score. Cards left in your hand or in your Foot count against you and are subtracted from your score. Since you cannot make sets of Threes, a Three can only count against you. Discard red threes immediately. On each round you have to have a number of points the first time you "put down" points onto the table. Once a player has the minimum points down, the player has no minimum for the rest of the round. the player must put the top card and the other two cards from his hand down as points on the table. Wild cards cannot count for the two cards in his hand. You cannot pick up a top discard of twos, threes or jokers because you cannot make a "set" from those cards. Remember that if this is the first time the player is "putting down" cards for that round he has to have a minimum to put down the first time. When a player gets rid of all his cards from his hand, he picks up his Foot and continues to play from there. If someone "goes out" before a player gets into his Foot, all the points in his Foot count against him (including any dreaded red threes). There are two ways to "get into your foot". One is to put down all your cards except one discard card (which you discard). Your turn ends, you have no cards, you pick up your Foot. You can begin using your Foot on your next turn. The other way to get into your Foot is to completely use up all the cards in your Hand (by putting them down as points on the table). If you can put down all your cards without discarding then you can immediately pick up your Foot and begin using the cards during the same turn. During the game you attempt to get piles of seven or more of the same card. If a pile has seven or more cards and there are no wild cards in the pile then the pile is called a Clean Pile. If there are seven or more cards in the pile and there are wild cards in the pile, then the pile is called a Dirty Pile. By convention, once a pile reaches seven cards they are pulled together into a neat stack and either a red or black card from the pile is moved to the top of the pile. A red card on top signifies that the pile is a Clean Pile. A black card on top signifies a Dirty Pile. A Clean Pile is worth 300 points and a Dirty Pile is worth 100 points. These points are in addition to the points from the cards themselves (each King is worth 10 points for example). In any set of cards you must have at least one more normal card than wild cards. For example, if you have three fives you can add up to two wild cards to the set. You can't add a third wild card until there are four fives down. Note that any wild card in a set makes the entire set dirty. You cannot have more than one set of the same card. For example, you cant have a pile of two fives and a wild card and then start a new pile of fives. In order to "go out" you must get rid of all the cards in your Hand and your Foot and have at least one Clean and one Dirty pile. You must also have a discard card. You can have as many clean and dirty piles as you want but you must have at least one of each in order to "go out". Players get points for clean and dirty piles even if they are not the player that goes out. Once a player "goes out", play ends for that round. The points on the table are added to your score. Points in your hand or your Foot are counted against you and are subtracted from your score. These variations of Steve Simpson's version above were contributed by Brian Brouillette. In this game there are two versions of the bonus scores. In the lower scoring version, the bonus scores are as in Steve Simpson's rules above. In the higher scoring version of the game, a clean (also called "natural") meld scores 500 points while a dirty (also called "unnatural") meld scores 300 points. This allows a player caught with one or more red threes during a round a chance to recover (since the red threes always count as minus 500 points each). In round four, a player must possess two clean and two dirty melds in order to be eligible to go out. When going out, you may if you wish meld all your cards; you are not obliged to end by discarding a card. If a wild card is discarded, the discard pile is "frozen" and removed from the playing surface of the table. These cards may be thoroughly shuffled and placed under the draw piles if more cards are needed to complete a round. Black threes can be used to create a clean meld that only scores 300 points in the higher scoring version of the game or 100 points in the lower scoring version of the game (minus five points for each card in the meld since black threes always count as minus five points each, even if melded). Wild cards may not be used in creating a meld of threes! The discard pile may not be picked up with a pair of black threes! This form of Hand and Foot can also be played as a partnership game. The rules are exactly the same as the basic version, except that players work in pairs, facing across the table from one another. One partner is chosen to keep all of the partial melds under construction that are put down on the table, while the other partner looks after the completed melds. Once one partner has put down, the other partner's minimum is immediately satisfied, since there is only one set of melds under construction per partnership. As with most partnership games, there can be no "talking across the table" to discuss the cards in play or strategies. The only game related discussion allowed is that when one person wishes to go out, that person must ask the partner, "May I go out?" If the partner says, "No," the play continues. To go out on rounds one through three, the requirement is to possess two clean melds and two dirty melds. To go out on round four, the requirement is for a partnership to possess four clean and four dirty melds. Roger DeMeritt's rules can be found on this archive copy of his Hand and Foot page. He also collected numerous variations with the aim of producing an improved uniform set of rules for the game that could be adopted by players everywhere. 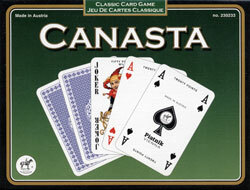 A variant for 5 to 7 players is described on the New Canasta page. Here is an archive copy of Bill Whitnack's Hand and Foot page. Here are Gary Grady's California Rules for Hand and Foot (Microsoft Word document). Another description can be found on the Hand and Foot page of Randy Rasa's Rummy-Games.com site. Larry Whitish's shareware Hand and Foot program is available from SAC Products. The Hand & Foot Online site provides an on line Hand and Foot server for Windows and Macintosh users. Hand 'n Foot, manufactured by JD Ventures, can be ordered from their web site www.HANDnFOOTgame.com. This deck has 262 cards: the 4 to king of a normal deck are replaced by cards numbered 1 to 12 (16 of each), there are 20 lords, which correspond to aces, 20 jesters, corresponding to twos but worth 25 points instead of 20, 10 jokers, 10 villains (black threes), and 10 ladies, corresponding roughly to red threes, but they can be discarded to block the next player or added to a clean pile for a bonus.